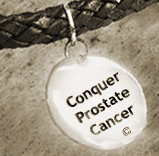 Conquer Prostate Cancer Now: Prostate Cancer: Fight, Flight or Acceptance? Prostate Cancer: Fight, Flight or Acceptance? Social scientists use the term "fight or flight" to describe how human beings deal with a major source of stress, such as a new prostate cancer diagnosis. However there is a middle way, as the following quotable quote suggests. When you first learned you or your partner had prostate cancer, which of these three patterns did you initially adopt? What makes acceptance difficult for you or others you know? To what extent do you now accept your being a prostate cancer patient or survivor even months or years after your diagnosis and treatment? Please share your thoughts in the space reserved for comments. Feel free to answer anonymously, or use only your first name or initials to safeguard your privacy. Yes this is absolutely true...initially there is a period when the patient goes into denial, doubting even that the diagnosis could be wrong. That's followed by depression and then acceptance, often accompanied by a willingness to challenge and fight the disease. You're right that accepting the harsh reality of cancer does not have to lead to passivity and "folding your tent." Accepting that you have a disease like prostate cancer can motivate you to stand up to it, fighting however you can, rather than succumbing by admitting defeat. Yes it is scary but with it comes immense strength to bear the illness and fight and live with it. I couldn't have said it better myself! Fear in the face of any cancer is anxiety-provoking and scary. But as some folks already know, the Chinese word for "crisis" consists of two combined words - "challenge" and "opportunity." As such prostate cancer affords us the chance to rise above our crises and show what we're made of. As you've implied cancer can be an obstacle that stops us "dead" in our tracks, or it can be a steppingstone to greater things: displaying our strength of character and our capacity to persevere.